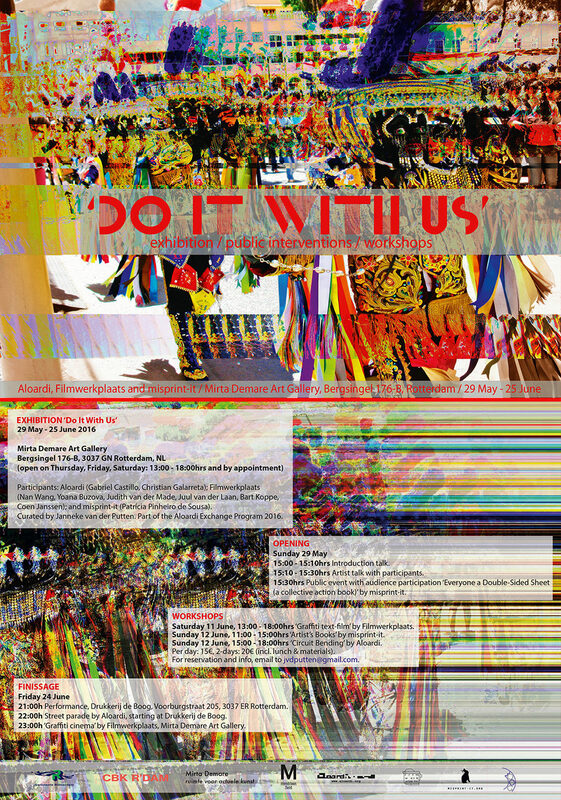 29 May Opening with event ‘Everyone a Double-Sided Sheet (a collective action book)’ by misprint-it, 15h. 11 June Workshop ‘Graffiti Text – film’ by Filmwerkplaats, 13 – 18hrs. 12 June Workshops ‘artist’s books’ by misprint-it & ‘Circuit Bending with Greeting Cards’ by Aloardi, 11 – 18hrs. 24 June Finissage with book presentation by misprint-it, procession by Aloardi & ‘Graffiti cinema’ by Filmwerkplaats, Drukkerij de Boog, Voorburgstraat 205, Rotterdam, 21h. 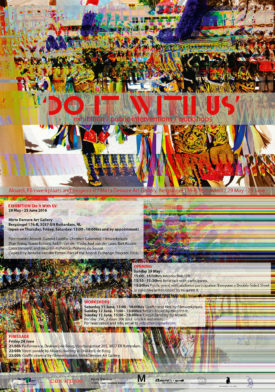 Exhibition ‘Do It With Us’ with Aloardi (Gabriel Castillo Aguero, Chrs Galarreta), Filmwerkplaats (Nan Wang, Yoana Buzova, Judith van der Made, Juul van der Laan, Bart Koppe, Coen Janssen, Patrícia Chaves) and misprint-it (Patrícia Pinheiro de Sousa). Curated by Janneke van der Putten. Mirta Demare Art Gallery, Bergsingel 176-B, Rotterdam. Supported by Gemeente Rotterdam and CBK Rotterdam (Centre for Visual Arts Rotterdam). Download the exhibition catalogue here.